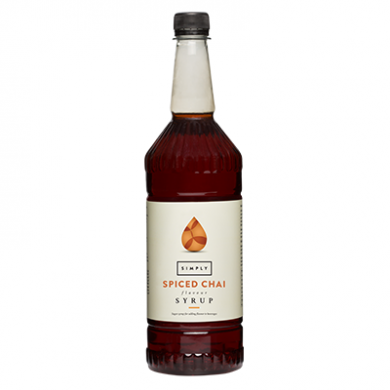 Simply spiced chai syrup is delicious and also amazing value in a large 1 litre plastic bottle. Because Simply spiced chai syrup is free from plant extracts it has a longer life once opened - important if on display behind the counter near hot coffee machines. You brew the finest quality beans to create the ideal coffee or espresso and by using our delicious Spiced Chai syrup you can add an exquisite flavour, to make the ideal drink for any occasion. 100% Natural - GMO Free. Simply Spiced Chai syrup is suitable for vegetarians and GMO free. Large 1 litre plastic bottle. Simply is a brand of the Italian Beverage Company (IBC) who are award winning British manufacturers, distributors and innovators within the food service industry. They have introduced leading edge products and flavours that have helped shape the industry for over 15 years. We are big on family and try to create that same ethos and feeling with all of our customers. In 2012 they won the coveted Queen's Award for International Trade for their successes around the world. You will find their products behind the counter in coffee shops, catering events, restaurants, online retailers and more, in 42 countries all over the world. Simply is the largest range of products in the coffee market and includes smoothies, frappe, milkshakes, flavoured syrups, hot chocolate and much more. We are a passionate company who truly cares about our products and customers. We aim to continue to be leaders in the coffee industry, innovating new flavours and product lines, to help keep our customers leaders too. Sugar, water, glycerine, natural spiced chai flavouring, salt, colour E150a, preservative E202, citric acid. Store in dry cool ambient conditions, away from heat sources and odorous materials. After opening, keep container closed. Keep cap area clean and free from syrup residues. Do not refrigerate - crystals may form in liquid at low temperature.